A 52.6% Income Tax Rate for the Middle Class? How much would the U.S. federal government need spend per household to even come close to balancing the annual U.S. federal budget? 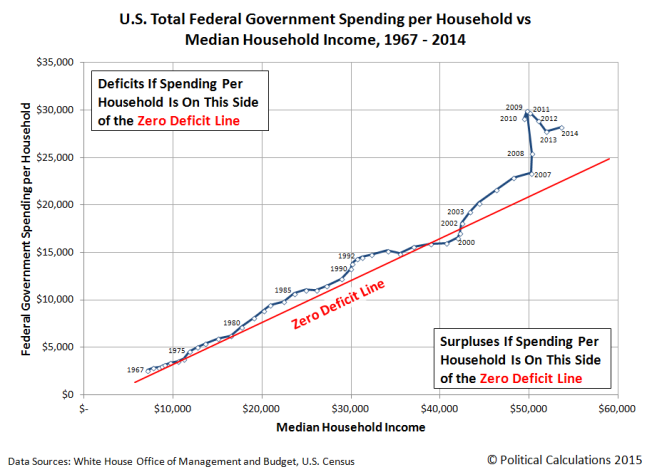 The latest update to our Zero Deficit Line chart reveals the answer! Our estimated median household income of $53,601 in 2014 would correspond with the U.S. government running a balanced budget if federal spending per U.S. household were held down to be $22,628, which is 42.2% of the median household income. But instead of spending that much, the U.S. government spent $5,576 more than that amount, or approximately $28,204 per U.S. household, which works out to be 52.6% of its income. One way to think of that 52.6% figure is that it is the effective tax rate that would need to be levied on the income of the middle class in the U.S. to support President Obama’s spending in 2014! We also observe in the chart that 2014 was a year in which the U.S. federal government stopped making significant progress in eliminating the gap between the trajectory for federal spending and the Zero Deficit Line. 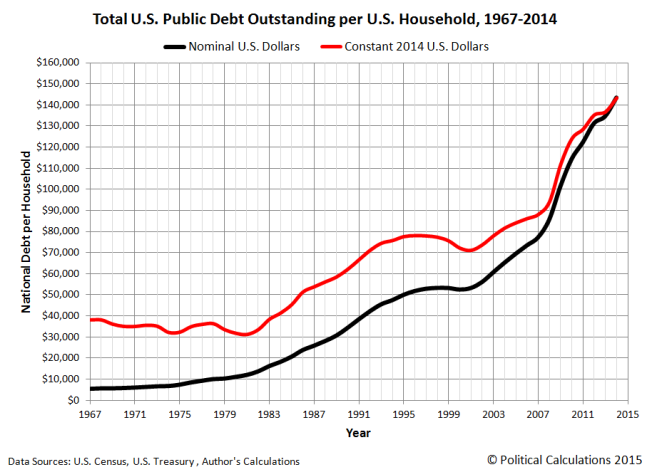 Which explains why the national debt per U.S. household reached an all time high, in both nominal and real (inflation-adjusted) terms. We estimate that 2014 saw the total public debt outstanding of the U.S. government rose to be an average of $143,382 per U.S. household, after having been essentially flat from 2012 to 2013. Picking up on that last point, the lack of growth of the U.S. national debt from 2012 to 2013 is mostly a result of the shell game that the U.S. Treasury Department was playing with the funds it controlled during the debt ceiling debate in 2013. As soon as the debt ceiling was lifted, ending the need for the U.S. Treasury to play its shell game, the national debt spiked immediately upward to the level it would have reached if not for that restraint. The apparent lack of growth of the U.S. national debt from 2012 to 2013 was really an illusion.